In an attempt to comply with Basel III norms to have higher tier I capital by financial year (FY) 2019, many public sector banks have raised capital through perpetual bonds, better known as AT1 bonds or additional tier 1 bonds. These have higher rates than tier II bonds. While a AAA-rated tier II bond of a public sector bank may have an interest rate of 7.5% per annum, its AT1 bond can carry a rate of around 9% per annum. These bonds have no maturity date. Technically they can continue to pay the coupon forever. The issuing bank has the option to call back the bonds or repay the principal after a specified period of time. The recent State Bank of India (SBI) issue, for example, can be called back after 5 years. The attraction for investors is higher yield than secured bonds issued by the same entity. But this comes with a two-fold risk. First, the issuing bank has the discretion to skip coupon payment. Under normal circumstances it can pay from profits or revenue reserves in case of losses for the period when the interest needs to be paid. Second, the bank has to maintain a common equity tier I ratio of 5.5%, failing which the bonds can get written down. In some cases there could be a clause to convert into equity as well. Given these characteristics, AT1 bonds are also referred to as quasi-equity. Individual investors too can hold these bonds, but mostly high net worth individuals (HNIs) opt for such higher risk, higher yield investments. Nikhil Johri, founder and chief investment officer, Trivantage Capital, said, “Investors world over are chasing yield, and perpetual bonds are becoming a big category. This isn’t a mass category product and is more suited for HNIs with the ability to understand the nuanced risk in the structure." Trivantage manages a fund with AT1 bonds through its portfolio management service (PMS). While these bonds are riskier, it doesn’t mean that one shouldn’t invest. The key is to understand your comfort level. Also, one must analyse the issuer risk. Given the higher risk, the rating for these bonds is one to four notches lower than the secured bond series of the same bank. For example, while SBI’s tier II bonds are rated AAA by Crisil, its tier I long-term bonds are rated AA+. “There is a big difference between fundamentals of a strong bank and a weak bank issuing these bonds. One has to look beyond the extra return and compare other metrics like capital cushion and profitability determine which bonds to hold," said Johri. The key is to assess the ability of the manager to analyse the underlying risk and take measured calls to benefit from the yield opportunity. Although AT1 bonds may be better suited for the more informed investor, retail investors too are exposed to them through debt and hybrid mutual fund schemes. The relatively higher yield of at least 1.5 percentage points presents an opportunity that’s hard to ignore. Sudhir Agrawal, fund manager and executive vice-president, UTI Asset Management Co. Ltd, said, “Logically, these bonds aren’t pure debt and that’s the interpretation we follow. In a hybrid fund, equity risk is already present and they can fit in well." There is some debate about whether these should be included in debt funds or not because of their quasi-equity structure. Lakshmi Iyer, head-fixed income, Kotak Asset Management Co. Ltd, said, “If the bonds don’t get called, they are similar to equity...Our assessment is towards repayment and, so far, evidence from previous issuances also suggests the same." 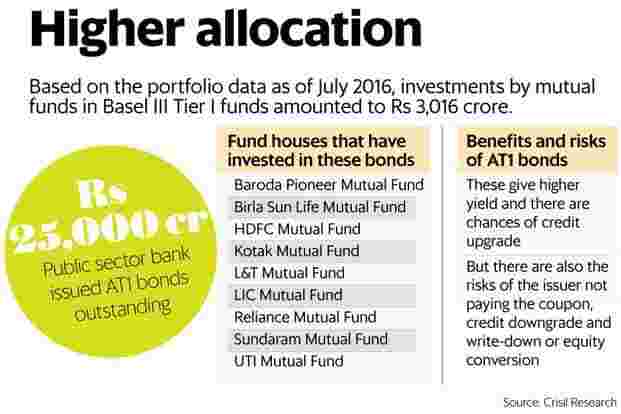 Either way, investing in these bonds needs a lot of analysis, which may be best left to professionals. Roopali Prabhu, head-investment products, Sanctum Wealth Management, said, “Regulations allow individuals to subscribe, but it’s not advisable to do so without an intermediary or an adviser with strong credit analysis skills." Along with the risk of skipping coupon payment, given the current losses of public sector banks, there is concern about the banks’ ability to meet additional capital requirements in time. “Bank capital requirements are going up and profitability isn’t there yet. With bad asset provisioning at a high, servicing high-yield bonds can be a concern, specially for small banks," said Karthik Srinivasan, senior vice-president, ICRA Ltd. But some argue that higher capital requirements could come on the back economic revival and loan recoveries can add to profitability, which secures coupon payment on these bonds. Krishnan Sitaraman, senior director, Crisil Ratings, said, “While there is discretion on coupon payment, we assume that under normal business circumstances, (banks) will not exercise it. Retail investors can look at the rating to assess risks and additionally at the extent of CAR (capital adequacy ratio) cushion. " Fund manager views are varied. If your mutual fund scheme is exposed to these bonds, it’s unlikely you will know about it, as it is difficult to separate bond exposure just by looking at the month-end portfolio. So, seek the help of an adviser to do this and ask the tough questions. Higher yield is a benefit only if you can accept the additional risk, which, if it plays through, can result in a capital loss even in a debt fund.